Made popular by Jackie Onassis Kennedy, Kili bags are intricately woven with young coconut fibers into classic polynesian purses. Kili bags originated from the Kili Islands, and are now found throughout Polynesian islands. There are four sizes of Kili bags; extra-small, small, medium, and large. 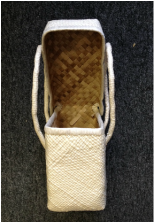 Each bag, hand-made in the Marshall Islands, features a lid that securely closes, and a tightly woven lauhala inside. The young coconut leaves used in our Kili bags are similar to the fibers used in Panama hats. Tightly woven pandanus leaves, from hala trees in Tahiti, create these beautiful lauhala bags. Sturdy leather handles sewn onto the bag are long enough to comfortably hang over your shoulder, or to grasp in your hand at your side. There are three sizes; small, medium, and large. Ate (pronounced ah-tay) vine bags are purses made of vine fibers. Ate Vine Bags have been treated with smoke, which brings out the oils of the fibers to give the bags a glossy finish, as well as prevents bugs from infesting the bags. Each bag securely closes using a tongue, or tab, inserted into a matching vine fiber loop. Tightly hand-woven pandanus leaves from the Solomon Islands create these cream colored, exclusive shoulder bags. Varying traditional designs decorate each unique shoulder bag. Each weaver out of the Solomon Islands uses natural or artificial dyes to create many designs and colors to decorate these shoulder bags. Each Fiji clutch is woven with pandanus, or voi voi in the Fijian language, leaves. They are a beautiful light brown color, making these rare Fijian clutches perfect for a day at the beach or a night on the town.